Limited Edition-RACHEL GALLEY Sugarloaf Cut Amethyst Allegro Pendant with Chain (Size 30) in Tri Colour Overlay Sterling Silver 10.460 Ct, Silver wt 12.33 Gms. Very Rare Rose De France Amethyst (Rnd) Beads Necklace (Size 18) with Magnetic Lock in Rhodium Plated Sterling Silver 200.000 Ct.
Amethyst (Rnd 9-11 mm) Beads Necklace (Size 20) Sterling Silver 286.010 Ct.
Rare Size Amethyst (Ovl 18x13mm), Natural White Cambodian Zircon Pendant with Chain in Rhodium Plated Sterling Silver 13.500 Ct.
Rose De France Amethyst (Pear 20x15 mm) Pendant With Chain in Rose Gold Overlay Sterling Silver 14.470 Ct.
Amethyst (Rnd 6-9mm) Beads Necklace (Size 18) with Magnetic Lock in Rhodium Plated Sterling Silver 200.000 Ct.
Rose De France Amethyst (Pear 20x15 mm) Pendant With Chain in Rhodium Overlay Sterling Silver 14.470 Ct.
GP Green Amethyst (Trl), Boi Ploi Black Spinel and Kanchanaburi Blue Sapphire Butterfly Pendant With Chain (Size 18) in Black Rhodium Plated Sterling Silver 13.000 Ct.
Amethyst (Rnd) Necklace (Size 18) in Platinum Overlay Sterling Silver 24.000 Ct, Silver wt 20.62 Gms. Number of Gemstones 106. Amethyst (Rnd) Beads Necklace (Size 18) with Magnetic Clasp Lock in Rhodium Plated Sterling Silver 200.000 Ct. The blushing and magical hues of amethyst is the reason why they’re so popular. Their show-stopping flair and mesmerising crystal clarity make them revered and tasteful. It goes without saying that these are the secrets that make amethyst necklaces all the more special and reverent. Find here a bespoke and besotted collection of the pure, rich, and novel takes on the popular style. Wear the lush grace of this magical stone around your neck and preen as the compliments flow your way. As the dainty charm of this faceted brilliance rests at the base of your neck, it calls for all appreciative attention. The flawlessly transfixing faceting done on the amethyst pendants make them the show-stopper that they are. Available with a chain, these selections in the amethyst pendant necklaces category come in celebrated and wide range of options. You must check out our creature couture collection for a more lively and animated display. 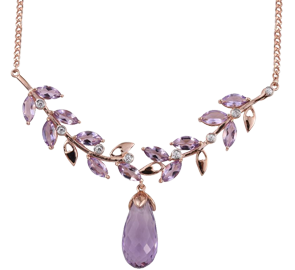 Statement necklaces are basically the popular and famed choices of amethyst necklace online that have blazed their trail. Making rounds of compliments and praises, these beauties have garnered centre-stage attention. Studded with the vitreous and graceful amethyst, the statement necklaces in our array come in bright new designs and ideas. Amethyst is a stone that looks just as spectacular in beaded form as it looks in faceted. And that’s why you’ll find some promising amethyst beaded necklaces that hold the exotic and pure hue of the said gemstone. With entrancing colour selection and high carat weight, the jewellery of this kind remains one among our top picks. Shopping for amethyst necklaces online in UK is like looking for a needle in a haystack. Only after ardent research can you know if your amethyst jewellery is pure and genuine. However, at TJC, there’s no concern of that kind. We are a name known, heard, and acknowledged as a market leader. We source our gemstones straight from the mines. So, you have assurances of high-end quality, which comes flawless and filled with posh grandeur. Other than that, you’ll also be privy to new and novel designs of these necklaces. We have a skilled team of famed designers that works day in and day out to perfect a sublime collection for you. Our range of amethyst necklaces in UK deserves all the praises for its uniqueness. However, this isn’t where your shopping stops. Get so much more from the promise of the lilac colours of amethyst other than just amethyst necklaces. Shop from our rich and varied ranges of rings, earrings, pendants, brooches, and whole lot more. We promise you exquisiteness in its neatest and most bling-y form at prices that’ll win your heart! Happy shopping!